These came out of new original equipment DC9360 or DCB361 battery packs. They come with what you see here. To rebuild your pack all you need to do is solder two wires and re-assemble the case. These do not come with the cell-balancing end-caps, just use the original ones. There are several types of cells used in the DC9360. The only ones we have are as shown. 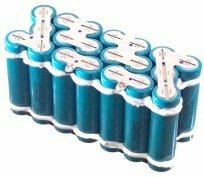 The blue one uses Samsung IFR18650-11Q, which are 1100 mAH lithium iron phosphate cells. 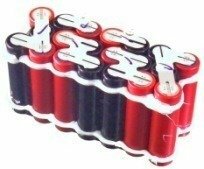 The red ones use Sanyo UR18650RX cells 2000mAH, which are lithium ion cells. They are not interchangeable! The battery management board in your pack is programmed to charge one or the other, but not both. Notice that the Sanyo pack has a 10 black cells and 10 red cells. The black cells are empty place-holders. This makes the Samsung and Sanyo packs roughly the same capacity, but the Sanyo pack is much lighter in weight. How to tell the difference. Early Dewalt 36V packs were made with A123 cells (26mm in diameter, encased in white cardboard). We don't have anything that will rebuild those packs. The Samsung cells were used in 2011, and the Sanyo cells were used in 2013-14. If it says "nano" or "nanophosphate" it has either the A123 or Samsung cells. The new DCB361 Dewalt packs still use the Sanyo packs that we call the DC9360-Sanyo. PLEASE NOTE: The DCB361 packs are almost impossible to repair, the battery management circuit kills itself when it detects that the battery has failed, even disconnecting it from a good battery usually causes it to fail. 2200mAH. Including the battery management module, no soldering necessary for this one. No longer available, the Sanyo pack (above), is NOT a replacement for this one, sorry. Due to shipping regulations, we ship these only by ground, no overseas export for this product.